The lauded Studio 192 Mobile, like all of our interfaces, ships with the award-winning Studio One Artist. But for a limited time, we’re throwing in around $210 USD worth of extras to sweeten the deal. Why? Because we’re nice. Hurry, this offer ends April 30! Studio One Remote Support: Control Studio One from your iPad! Great for solo drummers—no need to run back and forth to the control room every time you miss a hi-hat. 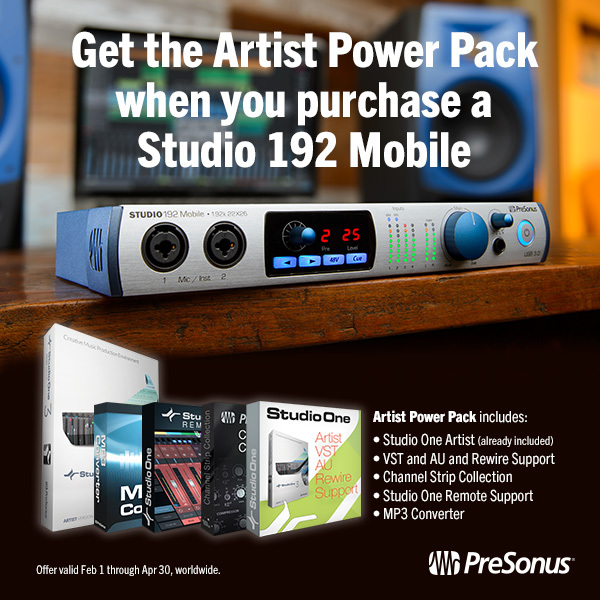 The Studio 192 Mobile offers all the processing power of its bigger brother, the Studio 192. Record in Sterling 192 kHz quality on the go—its small footprint makes it easy to record everywhere, from dorm rooms to garages. Native Instruments can seemingly do no wrong when it comes to compelling and original VSTs. One of their more recent endeavors is THE MOUTH, and enterprising YouTube accountholder void101a has posted a video detailing how to get THE MOUTH to talk the talk in Studio One 2. Well, I say “detailing,” but at two minutes there’s technically not a lot of time detail… which is good. When it comes to workflow, we try to keep it simple. This isn’t the case so much with our attitude toward convolution reverbs, but I digress. Here’s how to use your mouth.